"This is a weekly regular in our house during the winter. 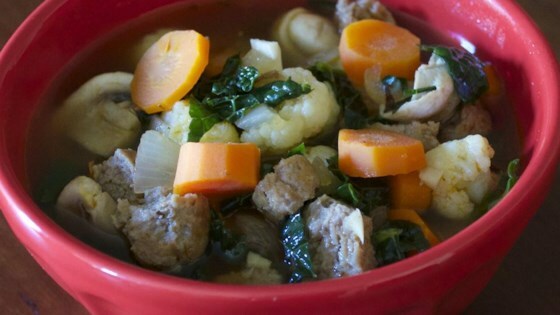 Full of winter veggies, it's hearty and warm on those cold winter days. I use my pressure cooker and the entire meal takes just 30 minutes. I love to use different flavored gourmet sausages and add asparagus when it's in season." Heat a large pot over medium heat; cook sausages in the pot until browned, 3 to 5 minutes per side. Remove sausages to a cutting board to cool, reserving sausage drippings in the pot. Cook and stir carrots and onion in the reserved sausage drippings until the onion is translucent, 5 to 7 minutes. Stir garlic into carrot and onion mixture; cook and stir 10 to 15 seconds. Pour the chicken broth into the pot; bring to a boil while scraping the browned bits of food off of the bottom of the pan with a wooden spoon. Return sausages to the broth along with mushrooms, cauliflower, kale, bay leaf, and oregano; stir. Reduce heat to low and cook at a simmer until the vegetables are tender yet firm enough to retain their shape, about 15 minutes. Remove the sausages to the cutting board, cut into 1-inch half-moons, and return to the soup. Simmer together another 5 minutes.